Here's the view as we walked in to see her finished for the first time! There is a spacious aft cockpit with centre table. The aft cabin is under the cockpit and the table acts as a skylight. 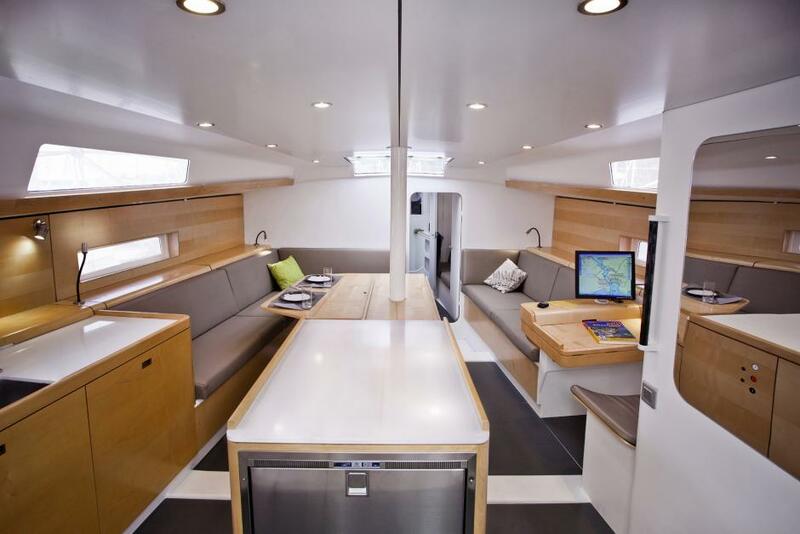 The galley is right at the bottom of the companionway for easy access. There is a fore-aft mounted fridge and a top loading freezer. The stove is a GN Espace model we've been excited to try out. The saloon is raised for excellent views while seated. 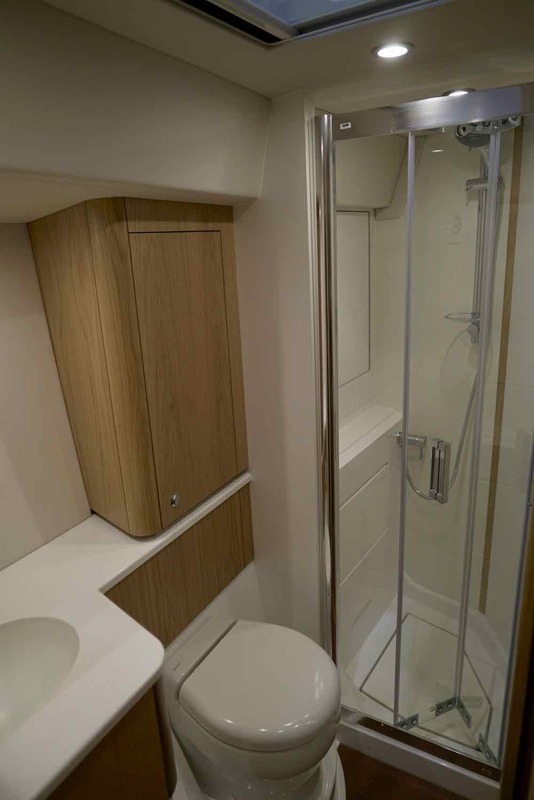 The forward heads has a separate shower. The aft cabin is palatial spanning the width of the stern under the cockpit. The cockpit table above provides 4 ventilation hatches. Side hull windows provide a good view. 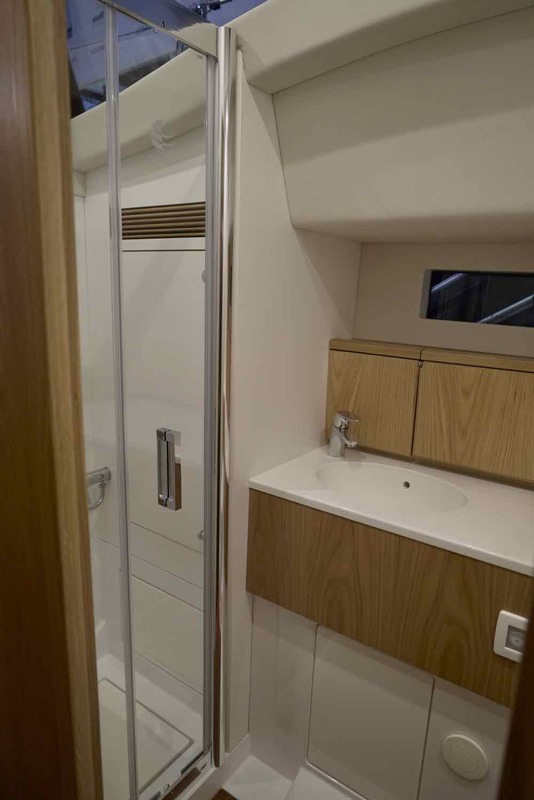 The aft heads also has a separate shower, and includes a wet locker for foul weather gear. 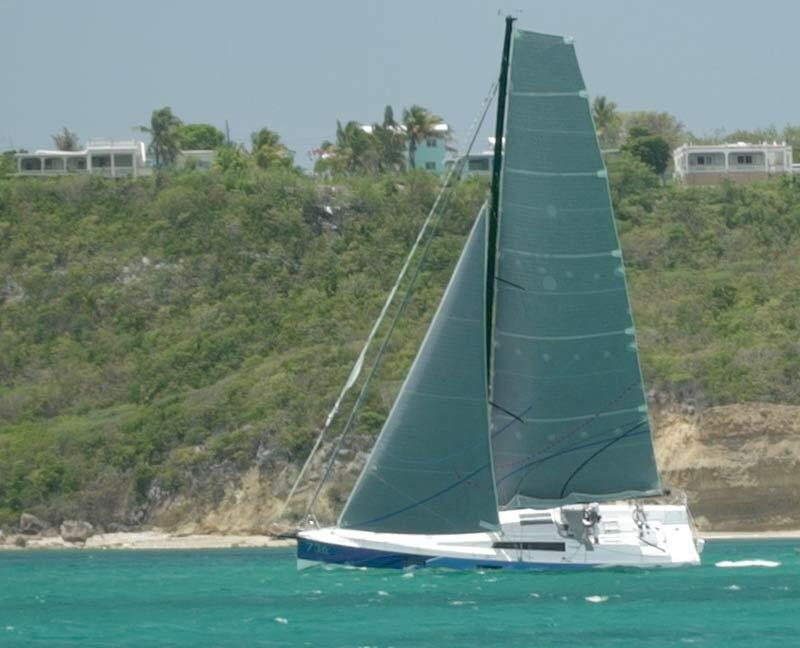 Distant Shores III draws just 1.0 meters or 3'3" with the keel up. Here's a stern view also showing our Varifold 4-blade propellor and the twin rudders. If you are in the area please drop by the Discovery stand to say hello and let us show you around. 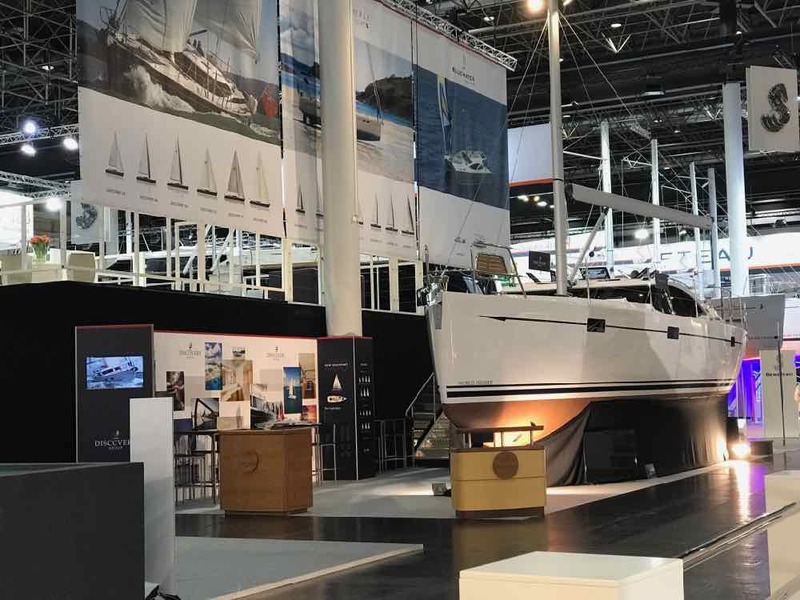 Boot Dusseldorf is "THE" show to see with more sailing yachts in one place than I have ever seen! So much has been done since we visited in the beginning of November!! Meanwhile the hull and interior is moving ahead well. Bulkheads are all in and interior modules are being fitted. 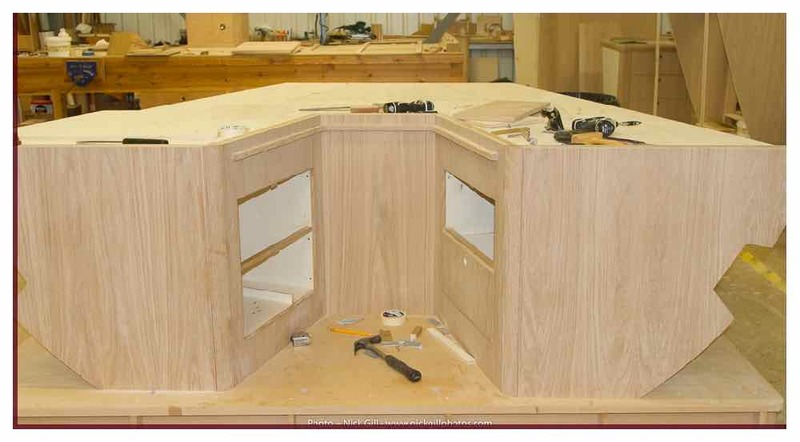 Over in the joinery department (woodworking) the last of the interior is being completed. 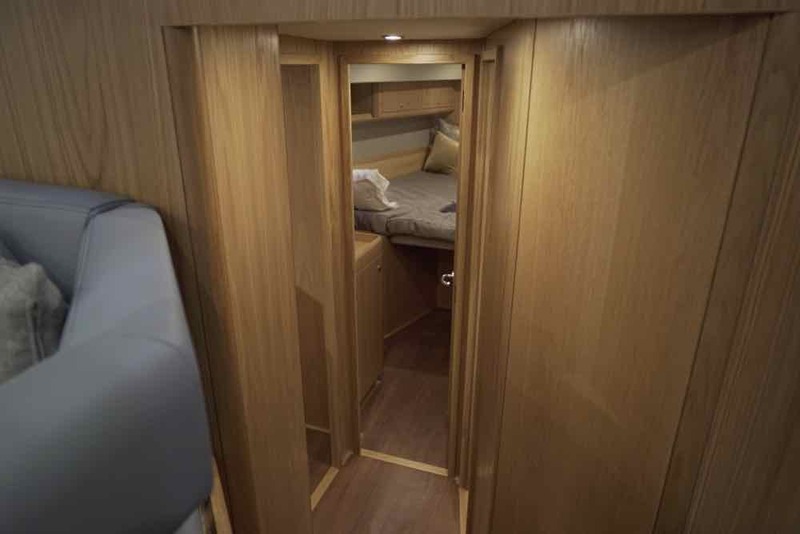 This is the forward cabin V-berth. Pieces like this are completed outside the boat then installed as a whole module and glassed into the hull. Jump ahead to early December and the deck has been laid up and is being pulled from the mould. In the lower part of the photo you can see the steel frame that keeps the mould perfectly strong and true. It is on rollers to move it around. 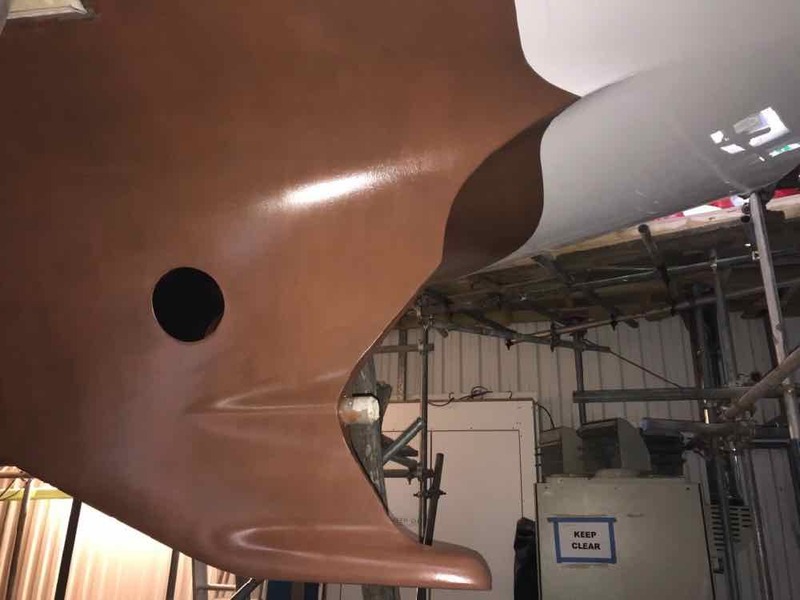 The hull layup has been complete for some time and has now been painted with anifouling - in this case we're giving "Copper Coat"… a try. First trial fitting of the deck. The bulkheads have been put in somewhat tall and must now be cut down to the proper height to be a perfect fit. This process can take a few hours to trim it just so before it can be settled in place permanently. 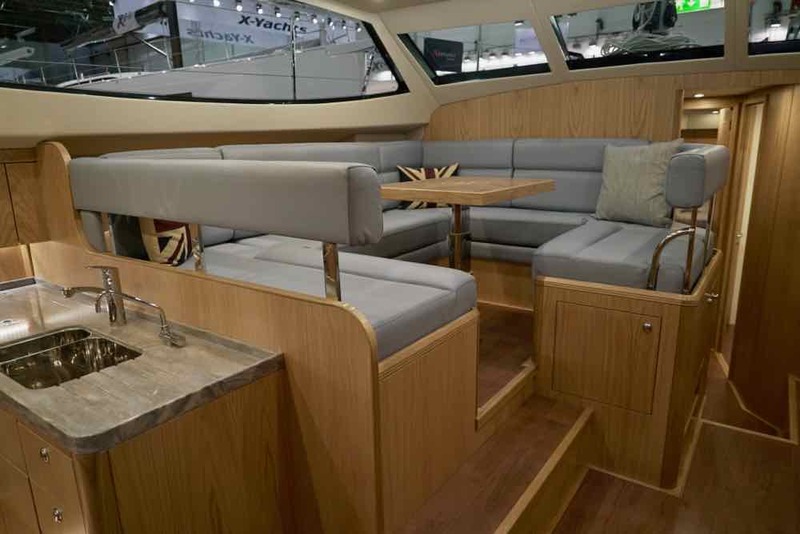 Discovery Yachts are famous for high quality cabinetry. 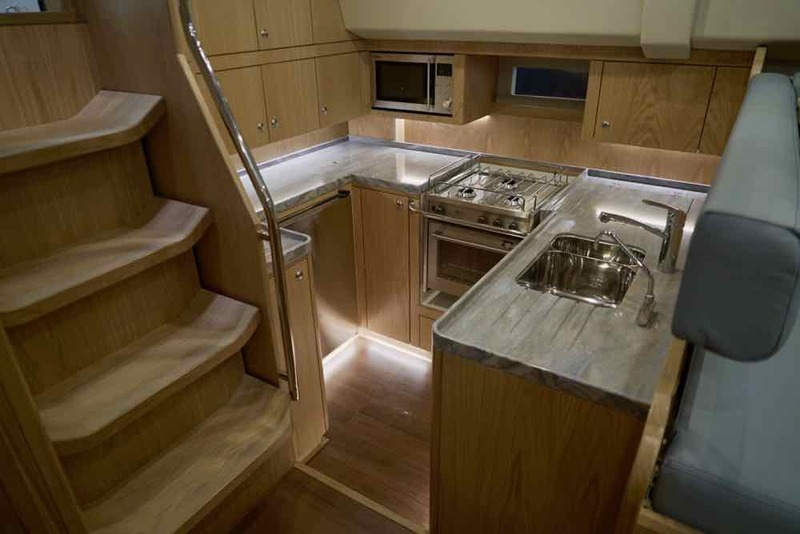 Here's one of the steps for the companionway … gorgeous! Today much more is complete! 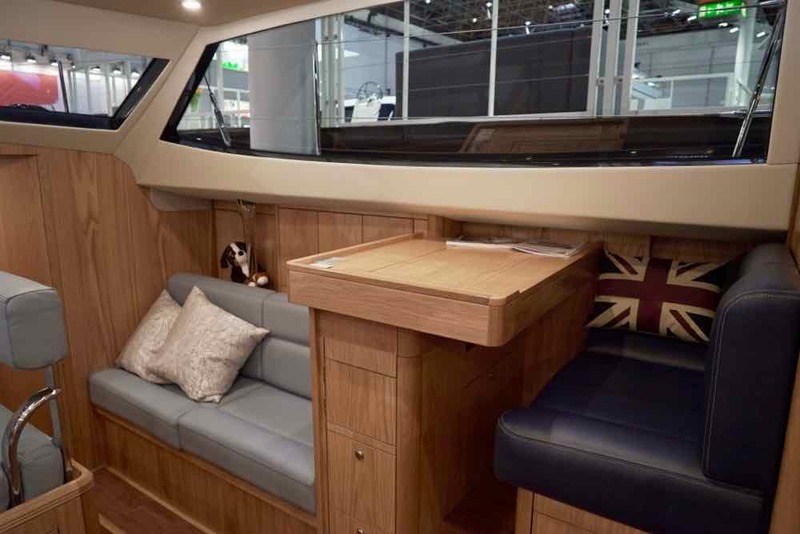 Hatches and deck hardware, windows and teak decking… but there is still much to do before Distant Shores III is slated to head off to the boat show in Dusseldorf THIS Weekend! 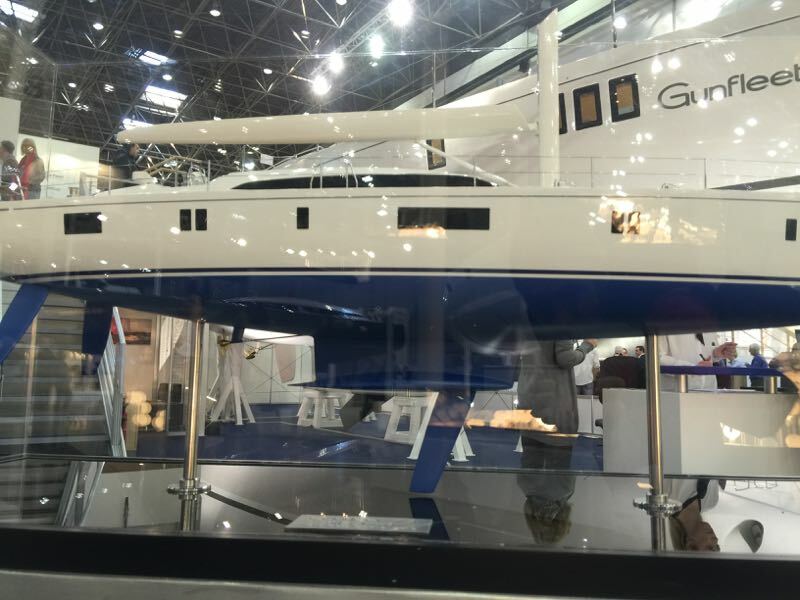 The boat show in Dusseldorf (January 20-28) this year) is the biggest indoor show in the world and has a huge variety of boats big and small. 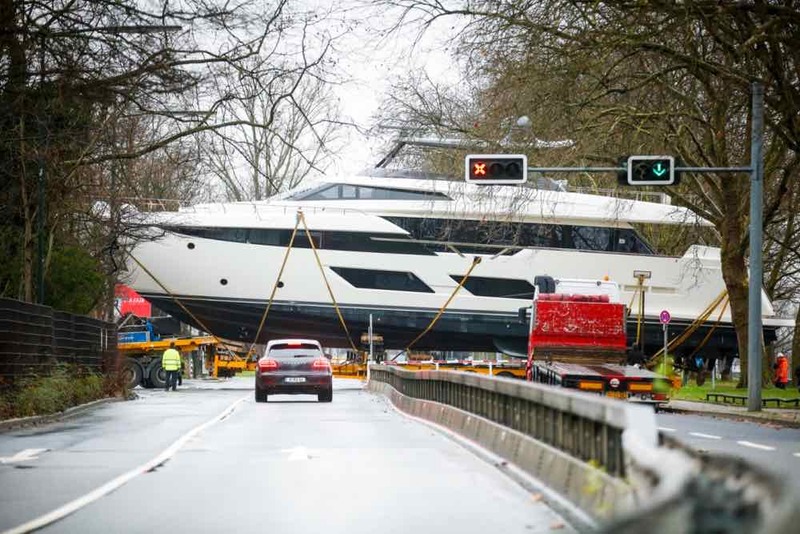 The venue is located right on the Rhine River so yachts can motor up and "Big Willi" will lift them from the water and its a short ride to the halls to display. There are more cruising sailboats here than I've ever seen in one location - including some quite large ones. It's a great show if you're trying to find your dream boat since more boats are in this one venue and you have days to compare them! If you're thinking of coming over to check out the show (and see Distant Shores III of course) please let us know! It's a very exciting time planning an upcoming cruise! Whether you are planning a summer cruise of a week or two, or planning something a little longer as we are… the planning stage should be a fun exercise as well as a chance to learn about your destinations and route. In our case we're planning our first trip out into the Pacific Ocean to the Galapagos, Marquesas, French Polynesia and onwards. 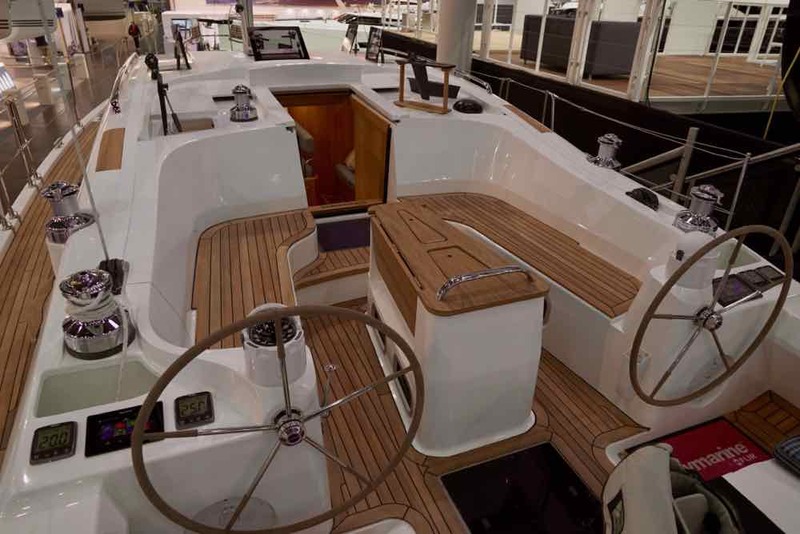 But first we will be back in the UK to collect our new Distant Shores III next spring, so our planning starts there. Of course it's still cold in March so we won't be planning very long passages. 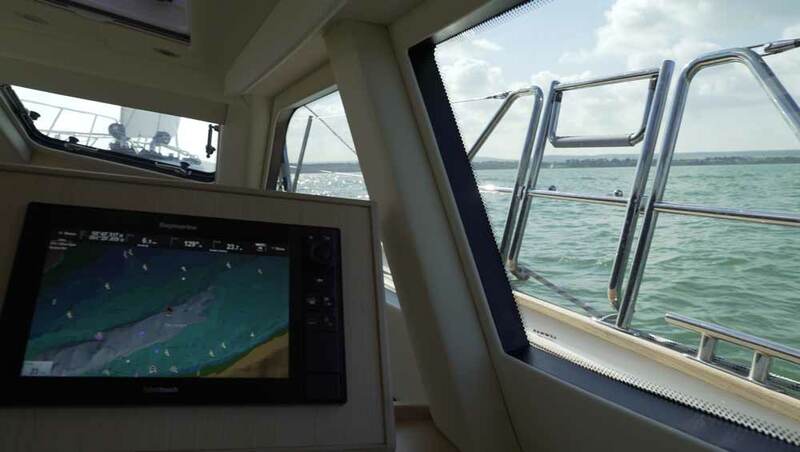 The Solent is a protected body of water with many nice harbours and uncrowded anchorages (that time of year) so it should be fun cruising while we get to know Distant Shores III. We will also plan some "open day" events then so if you'd like to come and see Distant Shores III there will be an opportunity as well. Looking forward to May with the weather becoming more pleasant we will be heading off on our first longer cruises. We'll cross the Channel to Guernsey in the Channel Islands and visit France as well. Then after one more trip back to the UK we'll set off on the big voyage. 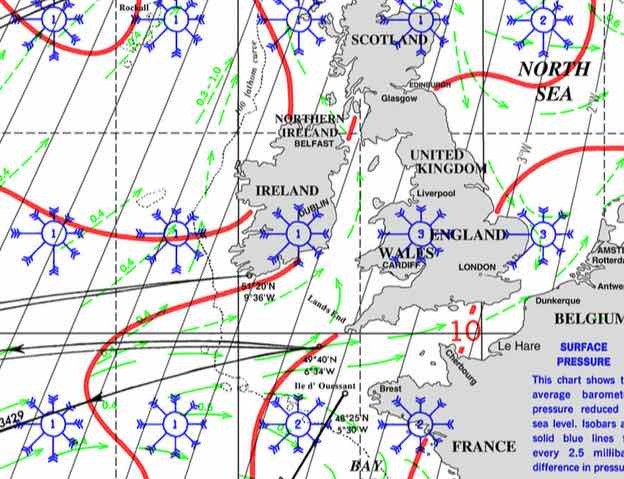 The summer plan is to head south along France, then Spain and Portugal to Gibraltar. 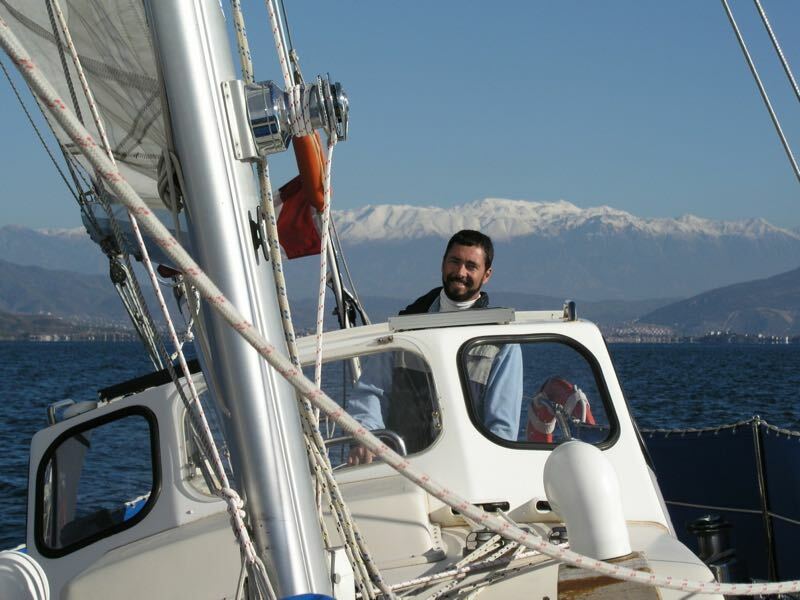 Way back in 2007 we sailed this coast in December (Yikes!) so are expecting a much warmer cruise with a chance to poke in some of the harbours we missed that time! Next we'll sail across to the Caribbean in November - arriving in Antigua in December to complete 2018 with a Caribbean Christmas. Here is our recent video Q&A on planning the world voyage. Are you planning a cruise in the next 1-2 years? Here is a (nearly final) drawing of our new Distant Shores 48, being built by Discovery Yachts. We're currently working with Discovery on the new design and think she's a beauty! A mainsheet arch keeps the cockpit clear while moving the attachment point to the boom aft. This is because mid-boom sheeting means high loads and a heavier boom as well. We learned from experience here (see Youtube). 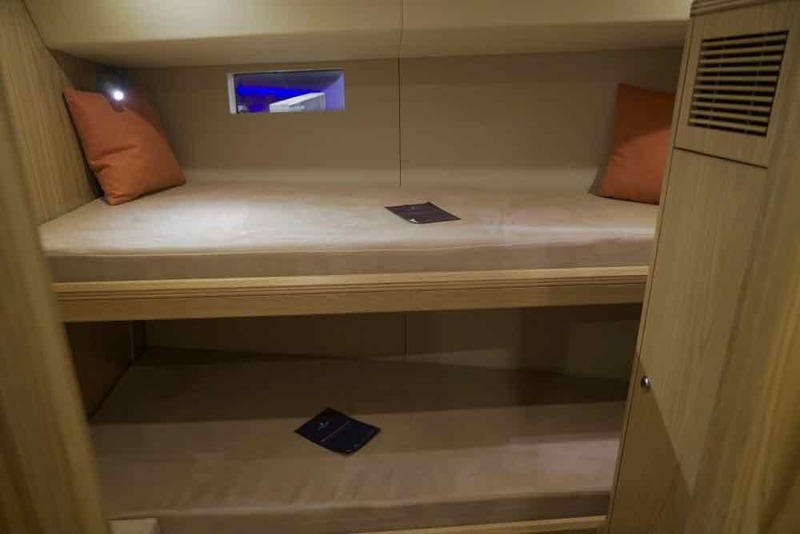 The pilot house design means more comfortable passages/night-watches as well as protection from the elements. Plus great views from the saloon! We'll get some better quality drawings in a couple of weeks! We also shot a Vlog style YouTube (below) on a Discovery test sail in England. 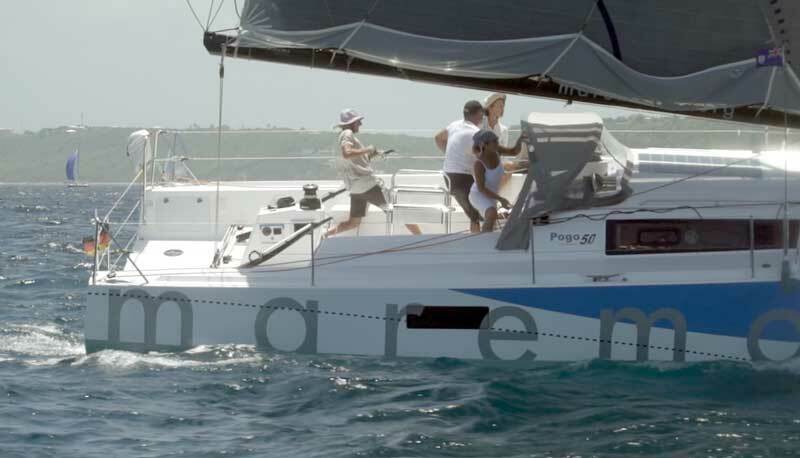 We sailed on a Discovery 55 (not the new 48 that we're building). 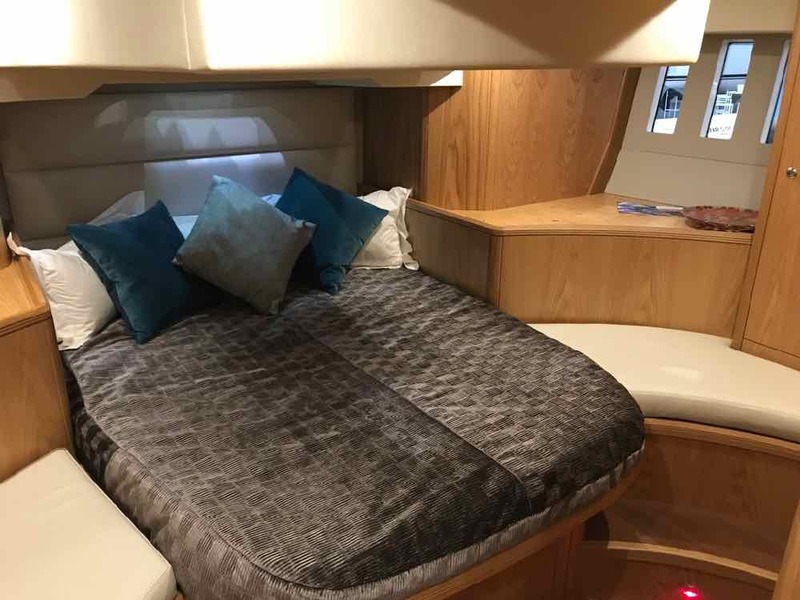 We also fly our new drone, visit southwestern Cornwall, meet horses on the highway in the New Forest, and look around the Discovery Yachts factory in Southampton. Although we've been aboard various Discovery Yachts at boat shows over the years, this was the first time we had sailed aboard one. Cool breezes ruffled the flags but it was sunny as we pulled out of Lymington and into the Solent on England's south coast. 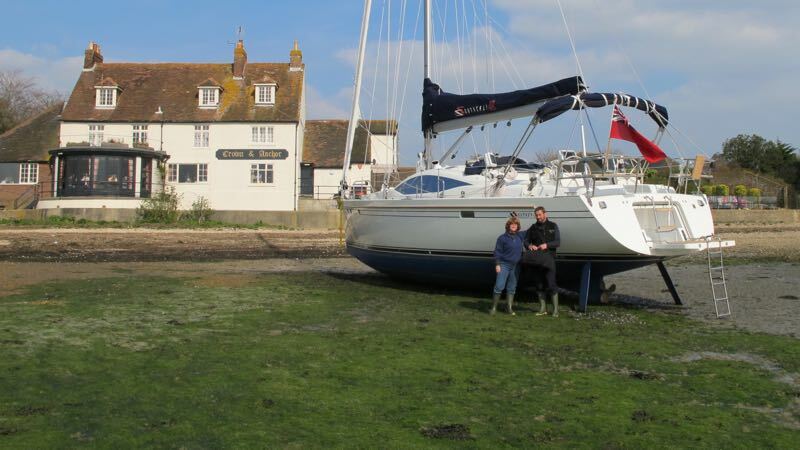 Luckily the wind got up to about 10 knots so we could move along and get the feel of this brand new Discovery 55 - just being handed over to her new owners. 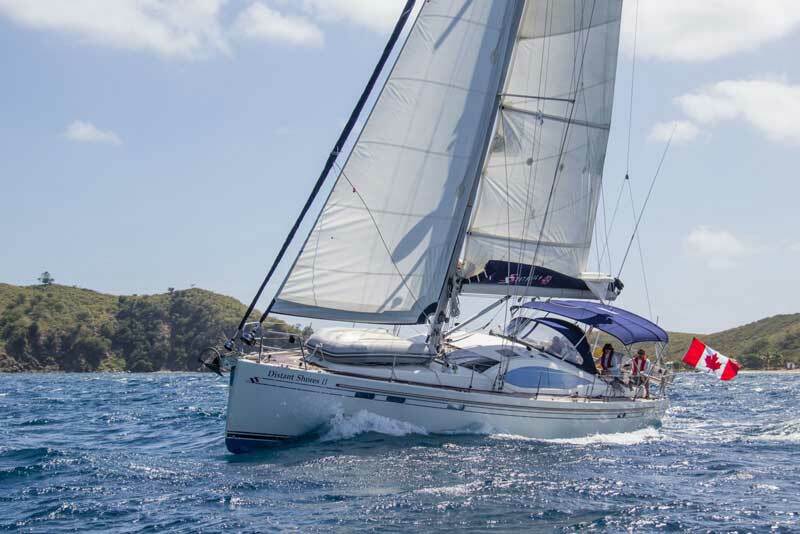 The Discovery 55 has a double headsail system with self-tacking jib and larger genoa ahead similar to the setup we had on our Southerly 49. 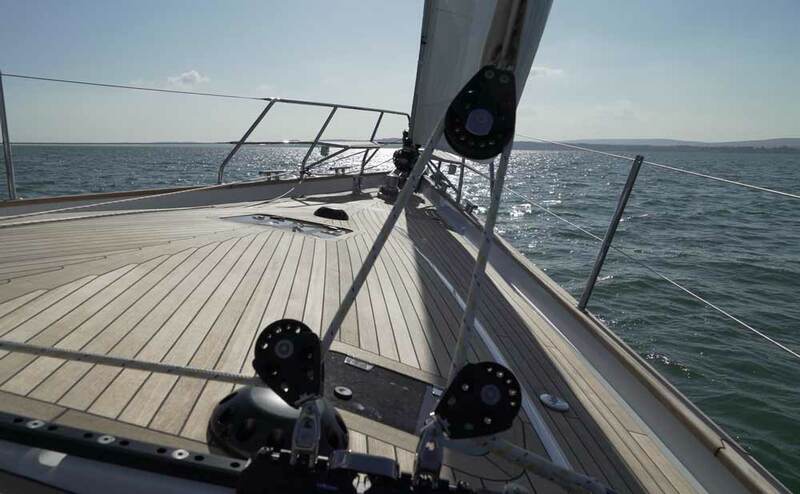 Normally in light winds we would use the genoa, but in the narrow Solent waters between Lymington and the Isle of Wight we flew the self-tacking jib instead. This way everyone could just relax and enjoy the sail. Making a tack is as simple as calling "tacking" and spinning the wheel. 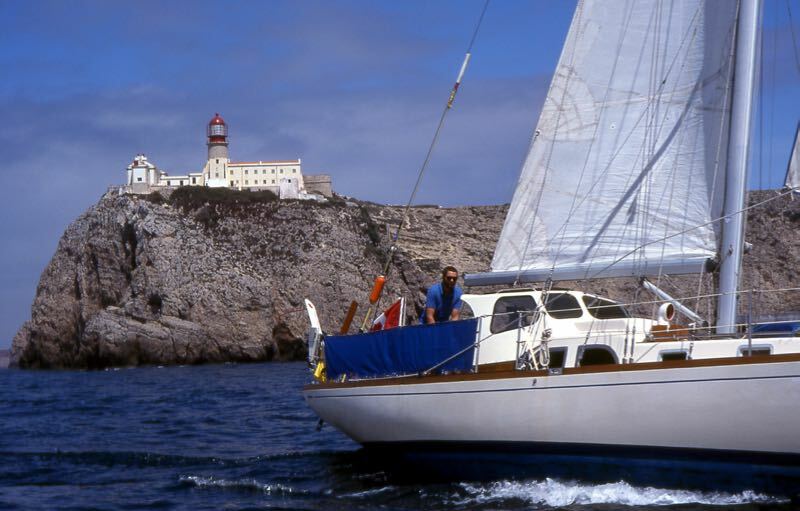 Most Discovery yachts are delivered with a Selden furling mast, and this one was the same, set up with standard Kemp Dacron sails. Some people recommend a high performance sail for in-mast furling units and I'm sorry we didn't have it to test. Nevertheless performance was quite acceptable and the boat pointed quite well with the self-tacker sheeted in. Looking at the self-tacking track above, I liked how it is rigged with the sheet running across the track. This is different from the way Southerly rigged it, and appeared to moderate the tacking procedure, smoothly sliding the car across. Nice! Down belowdecks the main saloon has magnificent views from the saloon table, and also a forward view for a helmsman in inclement weather. Our new 48 will have similar views. Buying a new boat is an exciting and (hopefully) enjoyable experience! Preplanning is essential for success. Changing something in the order stage, while its still on paper is MUCH cheaper than making changes later on. 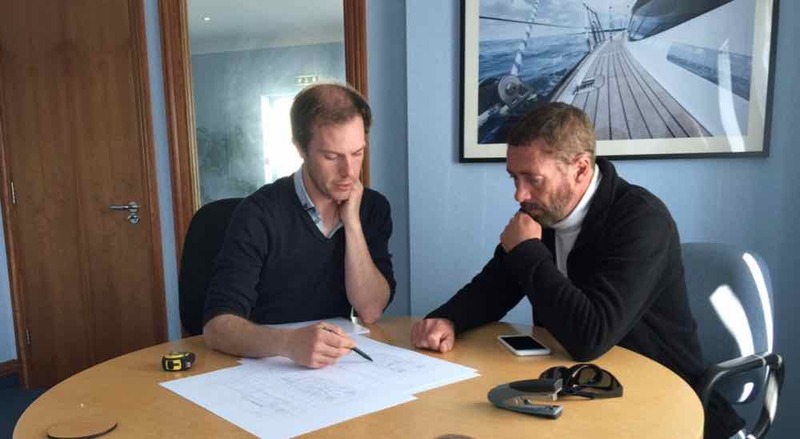 A company like Discovery is used to making changes to the yacht to insure it comes out as the owner wants. In many cases changes can be made from the standard specification for very little extra. But once production is underway, changes get much more expensive. In our case we will be making the first of the new 48s and there are so many choices to make. 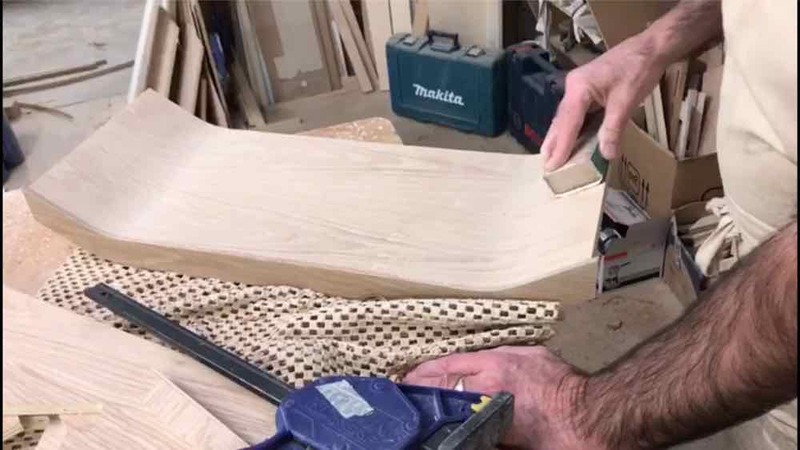 The deck mould will be produced in the next few weeks and we're working to make sure it's right. Building a new boat takes a while! 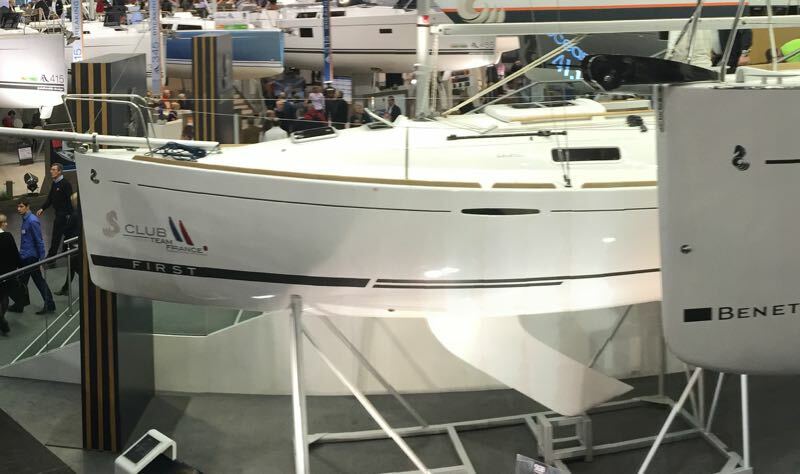 We are hopeful the new Distant Shores 48 by Discovery will be ready in time for the Dusseldorf Boat Show in January 2018. Better get back to work! 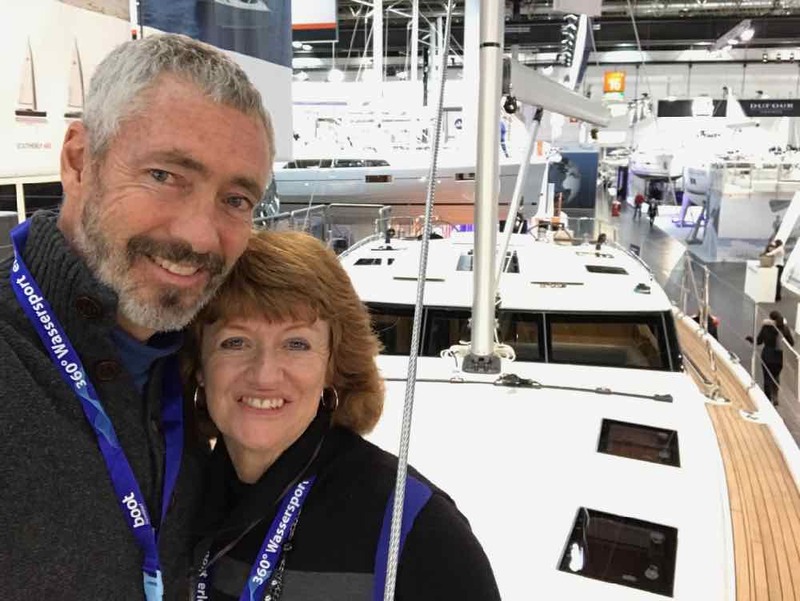 Throughout our 27 years of international cruising, Sheryl and I have sailed over 100,000 nm and 40,000 of those miles have been sailed on the two lifting-keel yachts - Distant Shores, a Southerly 42 and Distant Shores II, a Southerly 49. 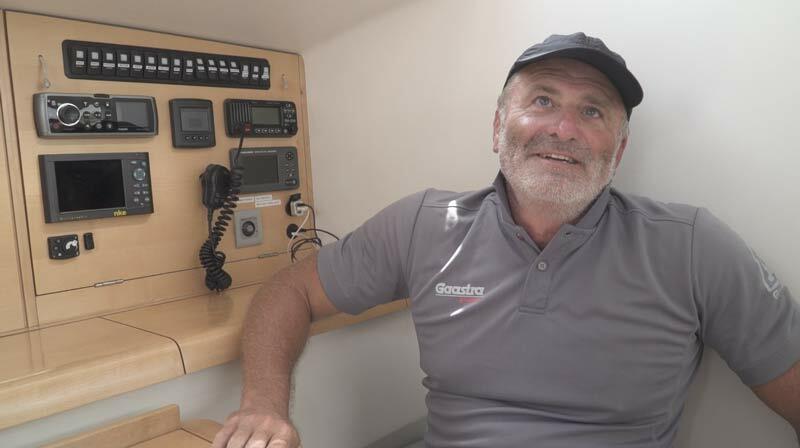 Many people have asked what it is like to sail such a boat, how they sail upwind, what to do in storms, what happens if you hit the keel, what to do in huge waves and more. We always put the keel all the way down when working to windward. 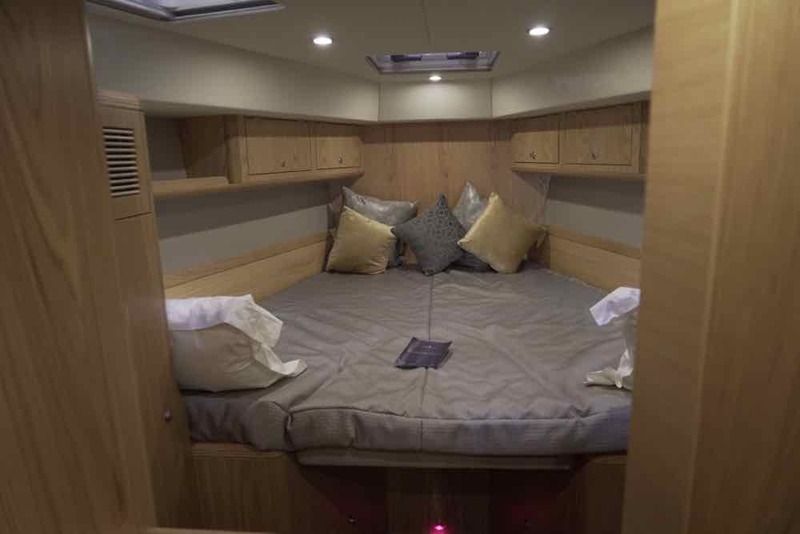 Our Southerly 49 draws 10' 3" (3.13m) with the keel down - an extremely deep aerofoil keel. 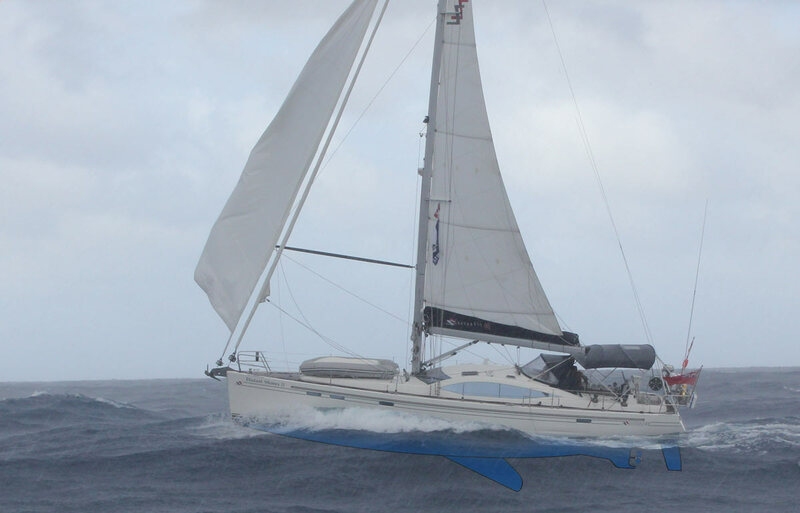 Since the swing keel is also deeper than a conventional keel, it performs well upwind. 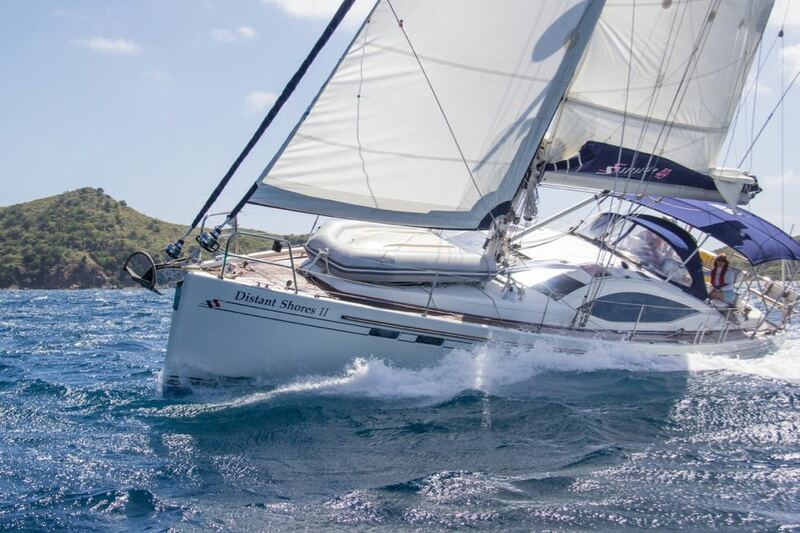 The design doesn't carry as much weight deep down so the boats aren't as light or stiff as a racing boat, but they do well compared to a standard cruising boat with a moderate keel and offer many advantages to the cruising sailor. 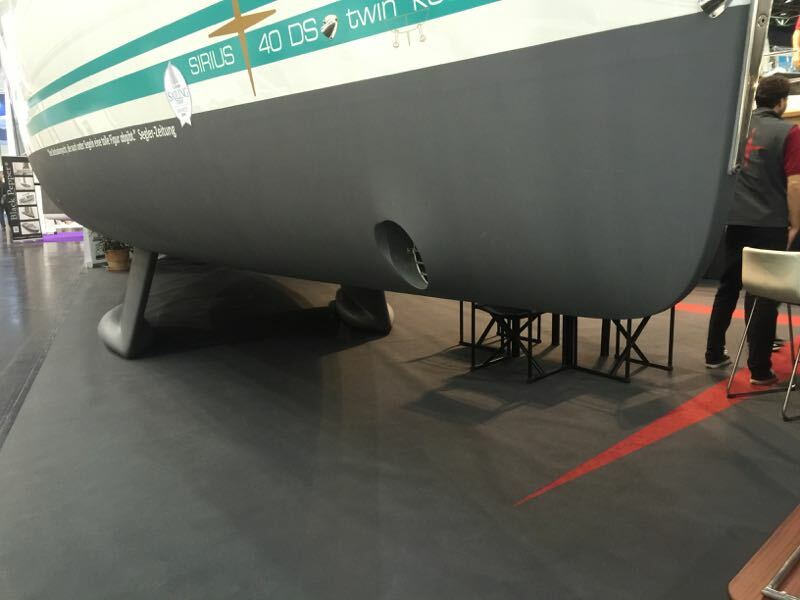 As you can see in the photo below, Southerly 49 keel at 10' 3" (3.13m) is a REALLY deep keel! Some centreboard boats have a flat board for a keel but the swing keels on the two Southerlys we've owned are both airfoil shaped and perform well upwind. 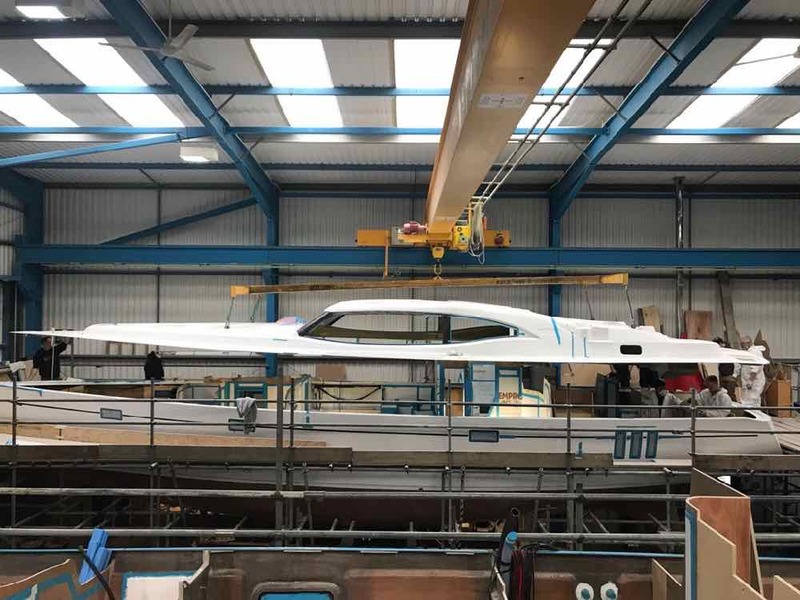 I asked world-renowned yacht designer Rob Humphreys how important it was to have an aerofoil shaped keel. He said, "It’s vital, and not just for upwind performance. 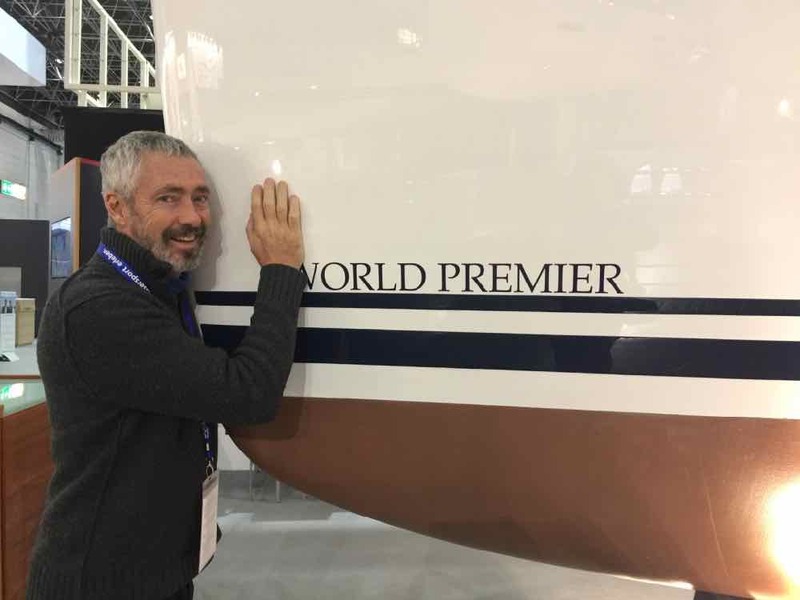 A well profiled aerofoil section keel optimizes the lift-drag ratio and widens the stall angle." 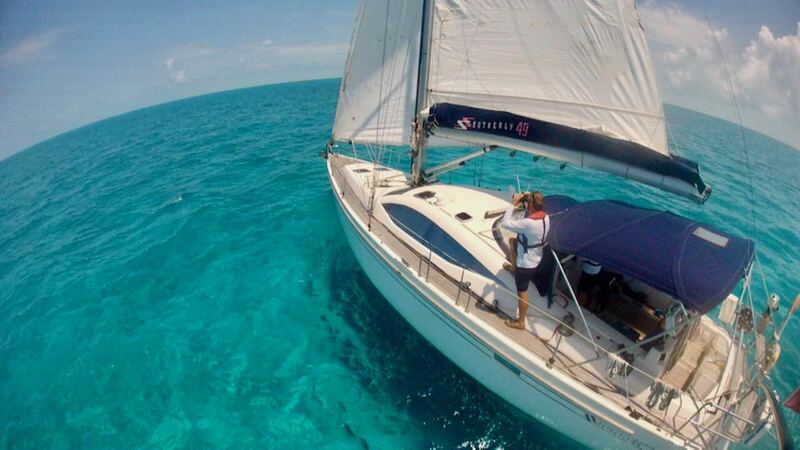 Whenever we are sailing in shallow water and there is a chance we might touch the bottom, we look over the chart and raise the keel to a comfortable depth. 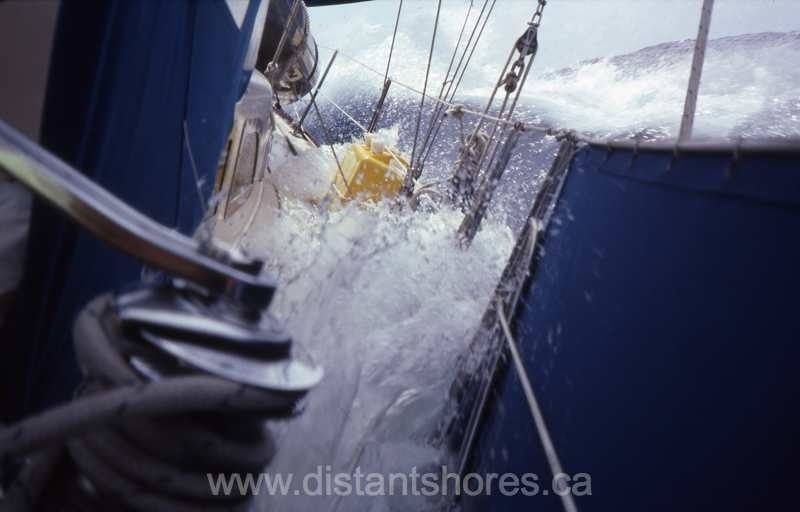 For example, when crossing the shallow Caicos Bank (photo below) we raise the keel halfway so we draw just 6-7 feet. The boat will still sail well, but she will not point as closely upwind. You can see we are close reaching. It is great to have this ability when exploring. 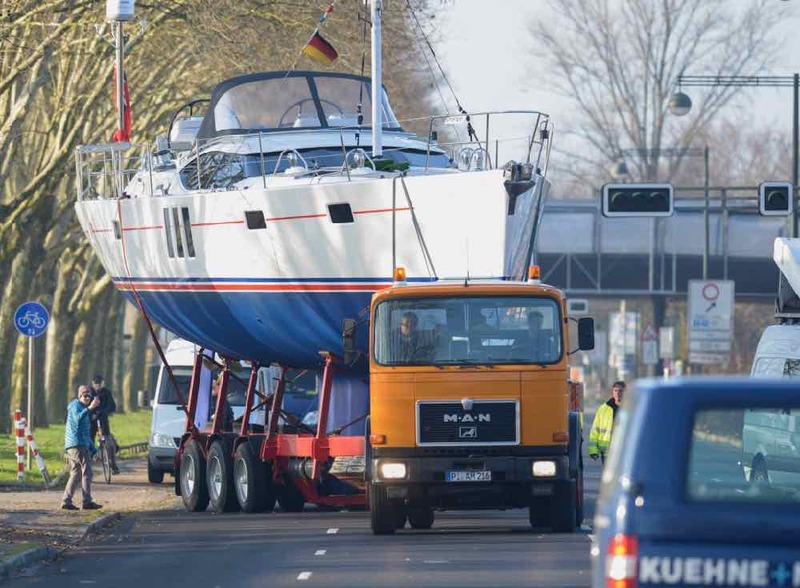 Lifting the keel can reduce or eliminate the risk of the yacht broaching. 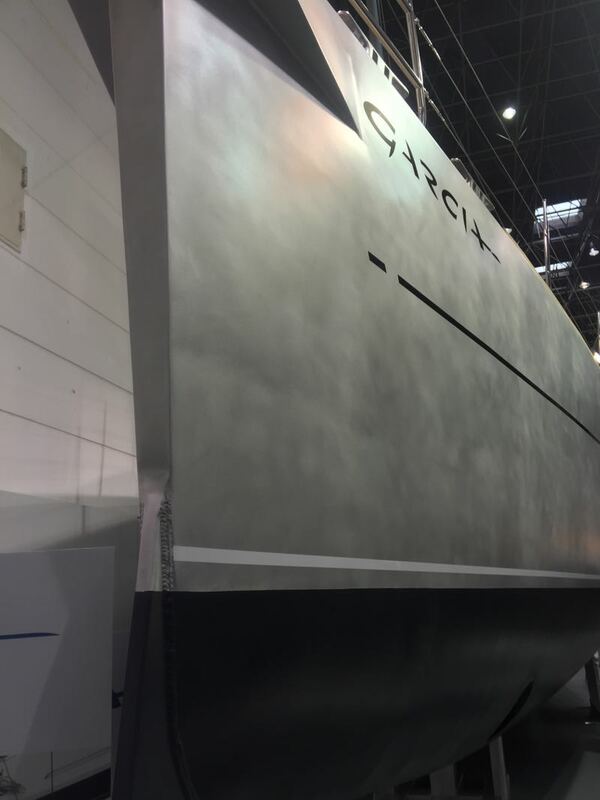 According to cruising guru Jimmy Cornell, who owns a Garcia Exploration 45, "continuing to lift (the keel) up to the point where the board is fully retracted, is a great advantage as the risk of broaching is virtually eliminated. 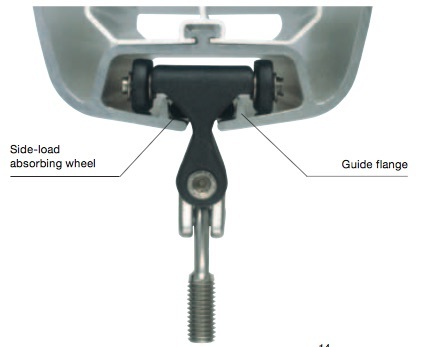 The absence of a keel to act as a pivot in a potential broaching situation means that the boat does not tend to round up when, in a similar situation, a keeled boat would do just that. 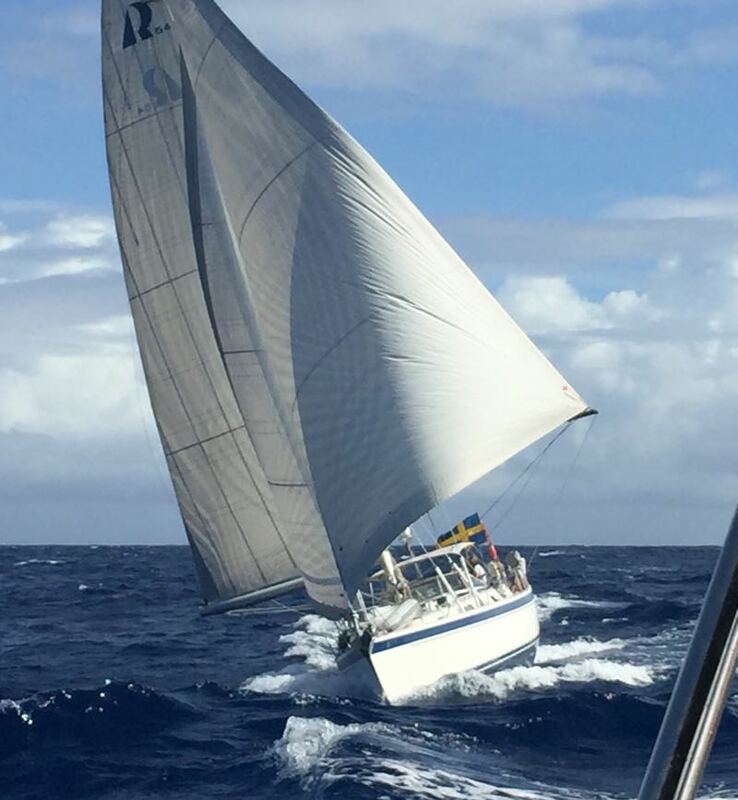 It is a feature that I have blessed on many occasions and that has allowed me to continue keeping the spinnaker up longer than I would have done otherwise." Before we sailed a Southerly Yacht across the ocean (we've now done it 5 times), I wondered what it would be like on a boat with a swing keel. 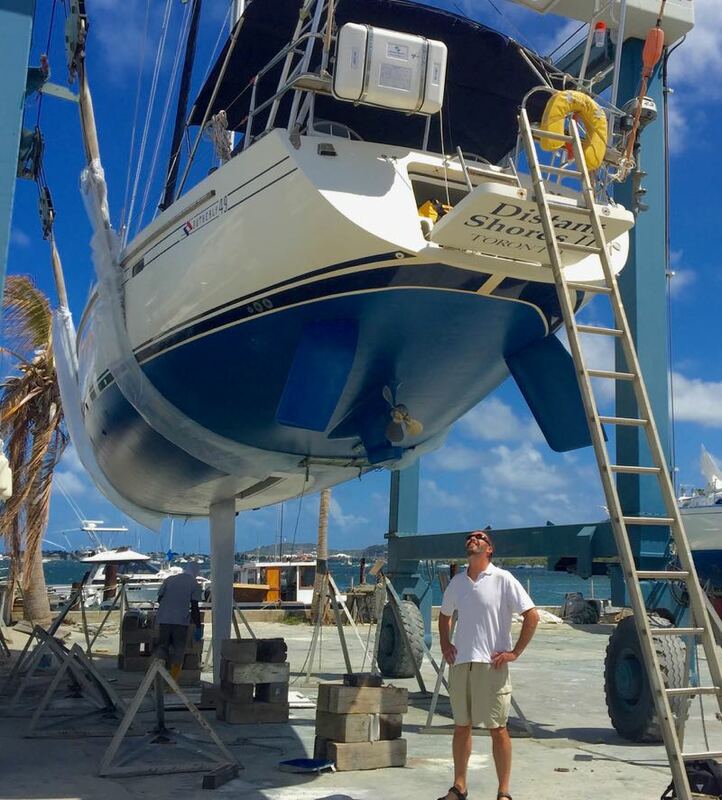 Talking with other sailors who owned shallow-draft swing-keel yachts, I realized there were more options for sailing efficiently if you have a lifting keel. 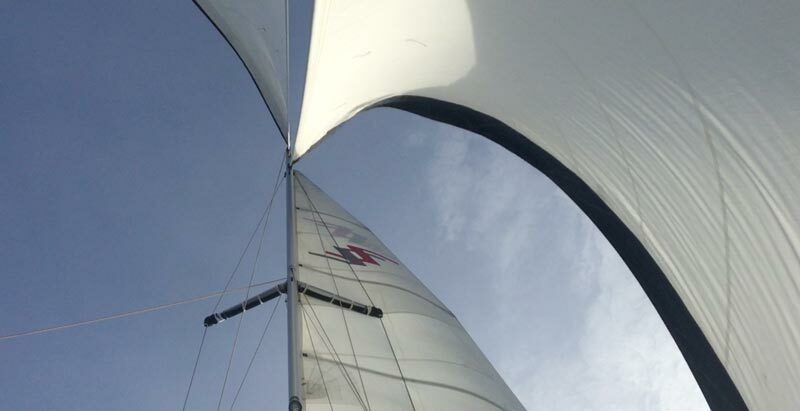 Swinging the keel up to raise it means you have actually moved the centre of lateral resistance backwards. It's possible to use this to your advantage when sailing downwind. 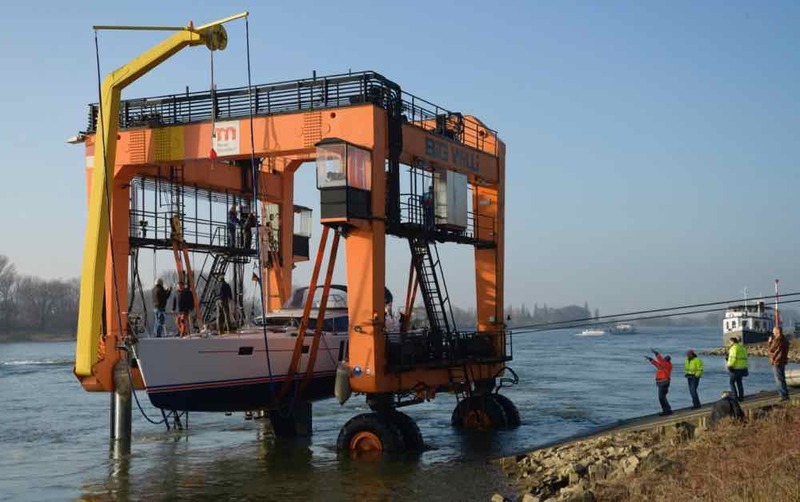 Normally the yacht designer has carefully calculated the best position to mount a fixed keel. 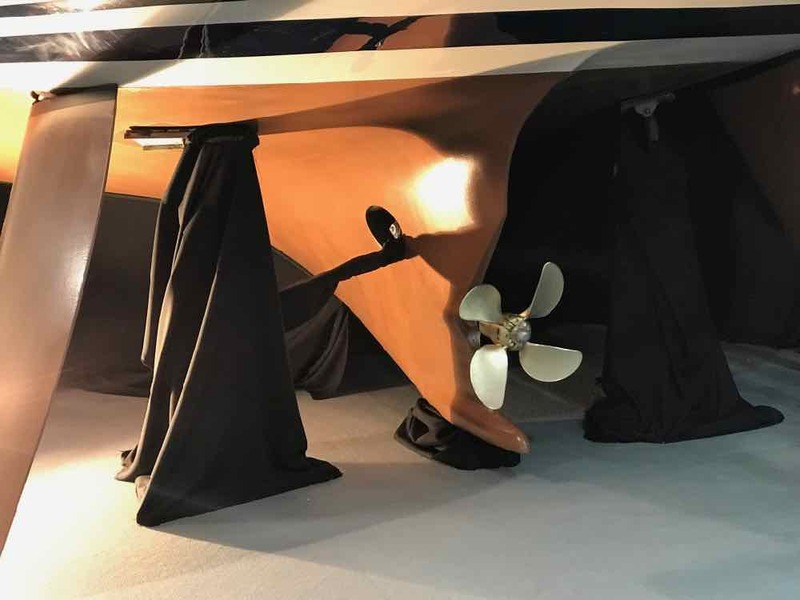 For a yacht with a swing keel, the design is done to optimize performance with the keel all the way down. When we swing the keel partially up, the centre of effort moves aft as you can see in the diagram below. We use this to improve performance when sailing downwind plus it reduces helm effort. It is similar to sailing a dinghy. 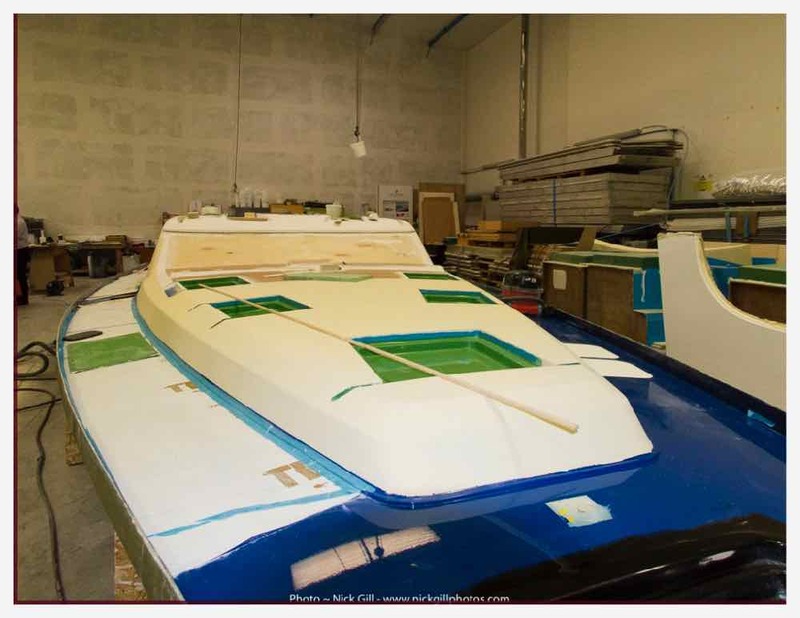 With the keel most 70 percent raised, we have modified the bottom profile so the boat is more like an arrow. In this position the boat loves to sail downwind! 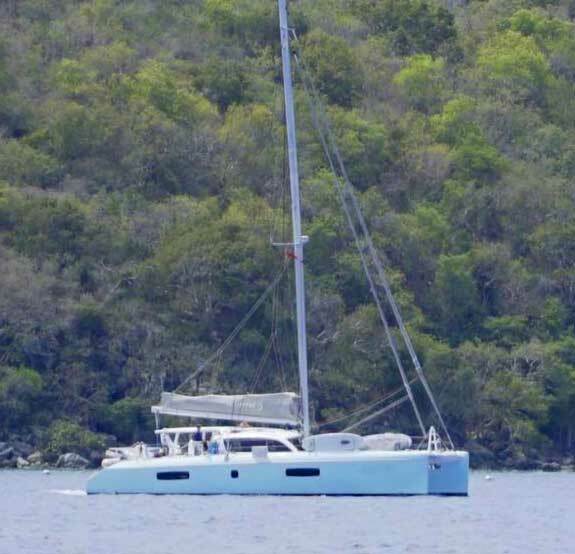 If you are considering buying a swing-keel yacht, please contact us for more information on the new Distant Shores III. 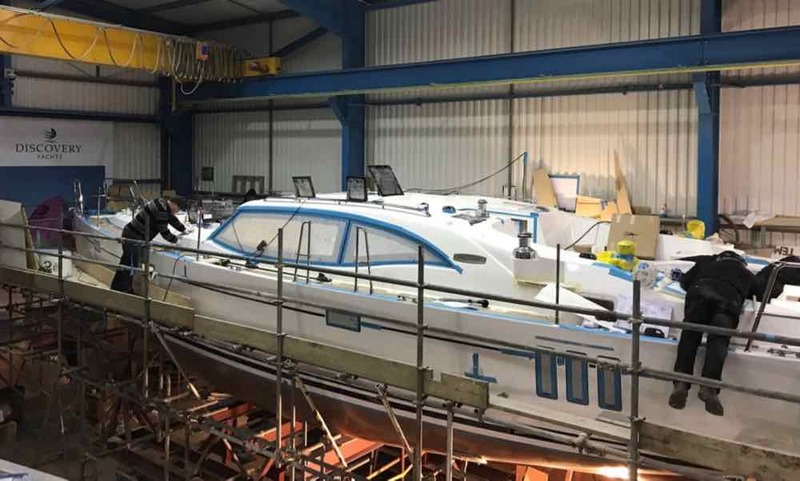 She will have a swing keel just like Distant Shores and Distant Shores II and, based on our experience, she will be a great boat for a circumnavigation! We are currently working with a design team to develop this new model - to be launched later this year! Can you sail with the keel up? Yes. 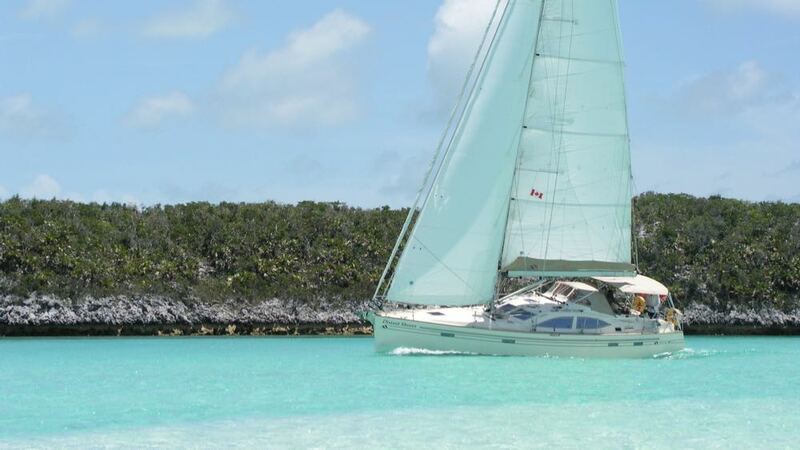 The boat is safe to sail with the keel in any position including raised all the way up. Naturally the boat makes a lot of leeway when going to windward with the keel completely retracted, but she only heels a few more degrees. 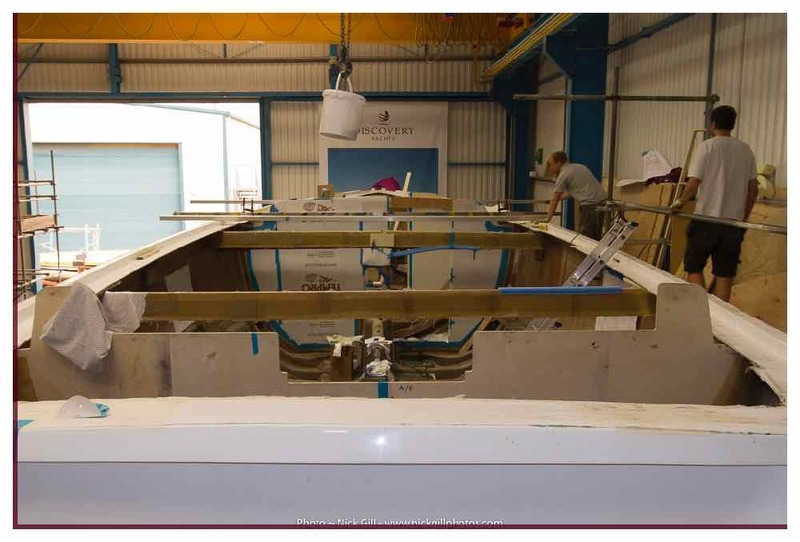 To understand this you can look at the image below of the keel for our Southerly 49 before it was installed during the build. 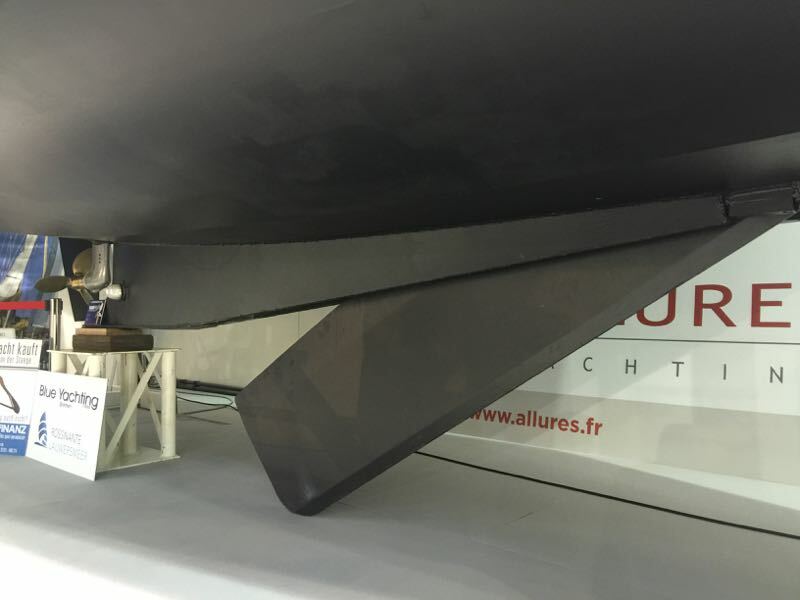 The keel assembly consists of the massive grounding plate (weight 3180 kilos) plus the swinging keel at 2050 kilos. When you swing the keel up the centre of gravity does raise but not by enough to effect the safety or heeling by very much since so much of the ballast is in the grounding plate. 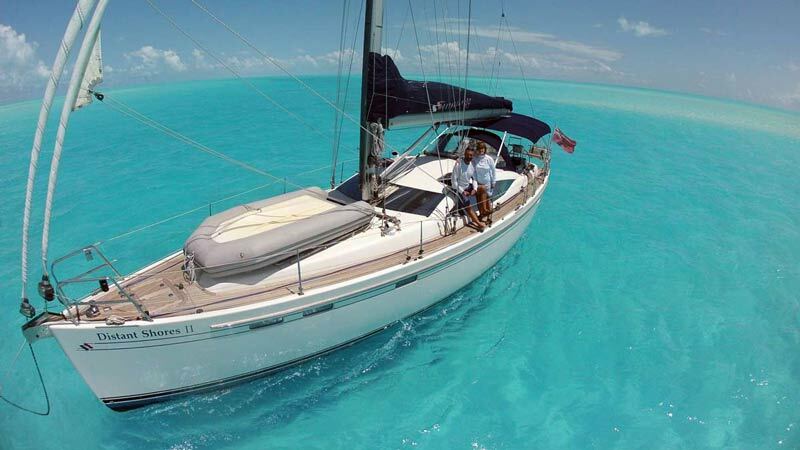 In the picture above we have the keel of our Southerly 42 almost all the way up sailing the shallows of the Bahamas. We are drawing about 4.5 feet instead of our usual 9 feet (2.72m), the deepest draft of the Southerly 42. 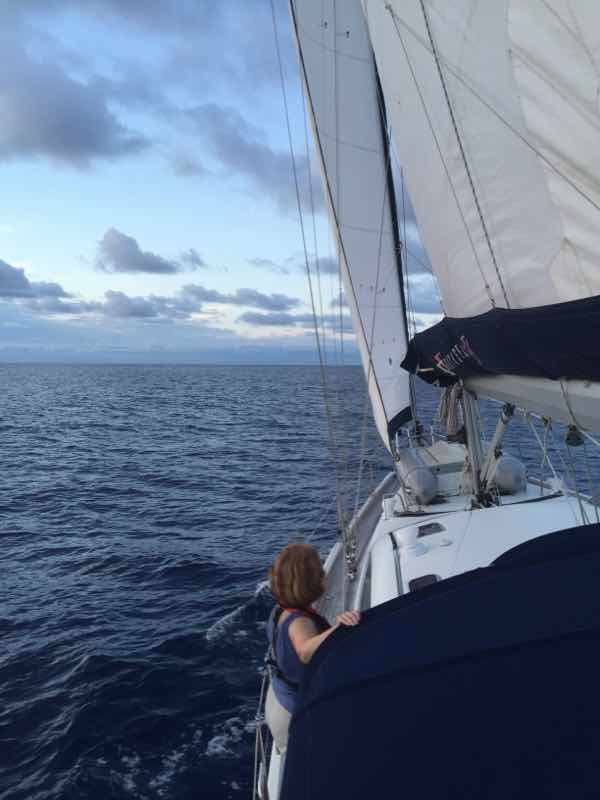 We are beating upwind and, despite making more leeway than usual, she still makes progress upwind. 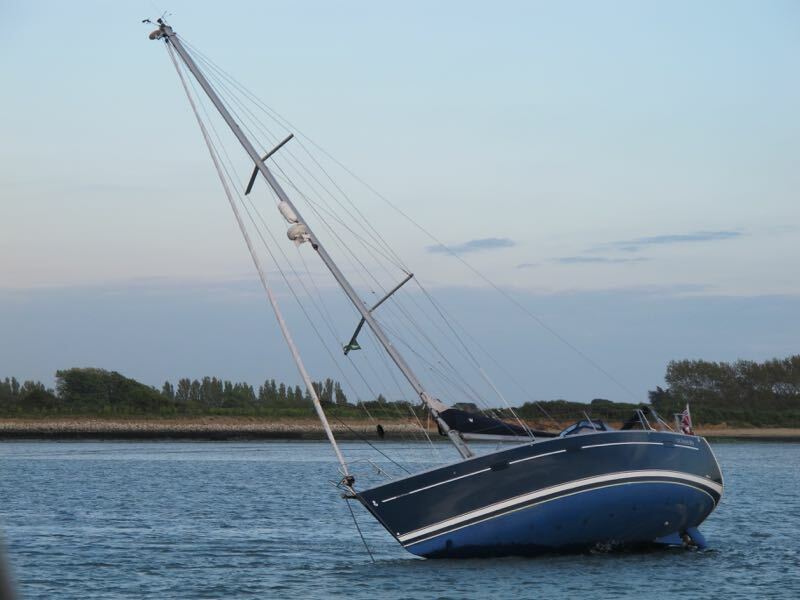 What happens if you run aground? 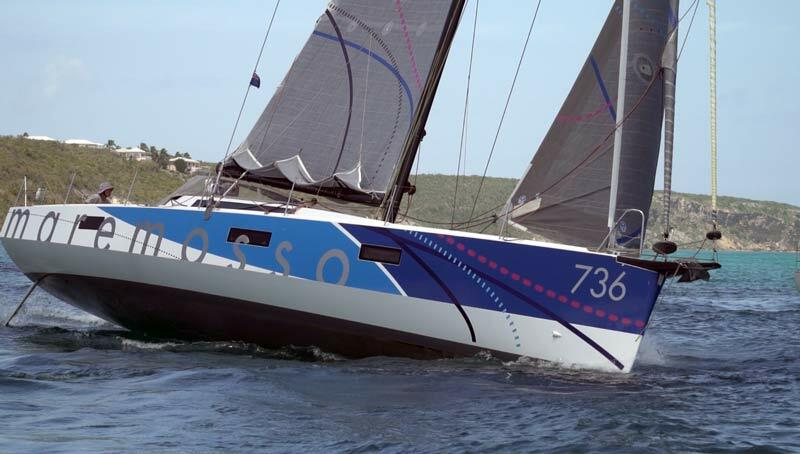 The keel is designed to swing up into the hull when raised. Since it pivots on its front bearing in normal operation there is no damage if you hit something. Of course we try not to run aground, especially when moving at speed. The lifting pennant goes slack and the boat slows down. This is unlike a "vertically-lifting" centreboard which can be damaged by hitting something as the board jams in its case. We have never heard the keel move while sailing either of our Southerlys. 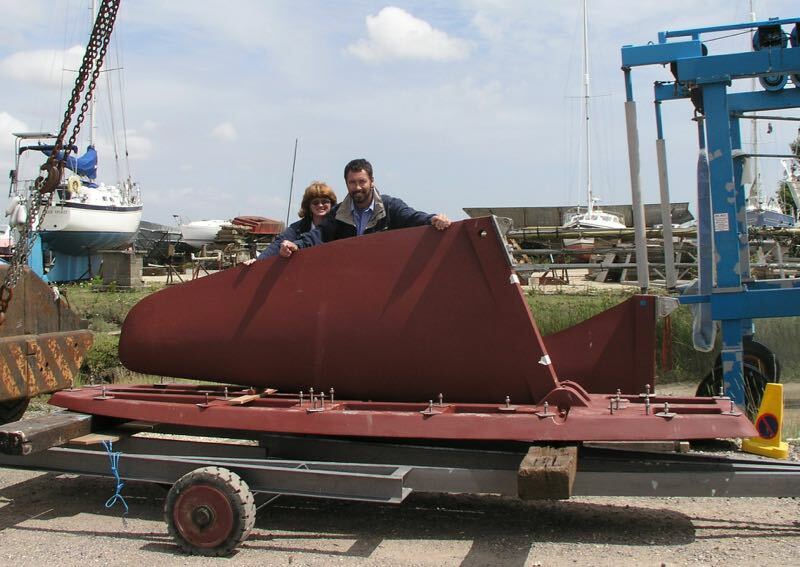 We do not call it a centreboard since the weight and profile make it more like a regular keel. 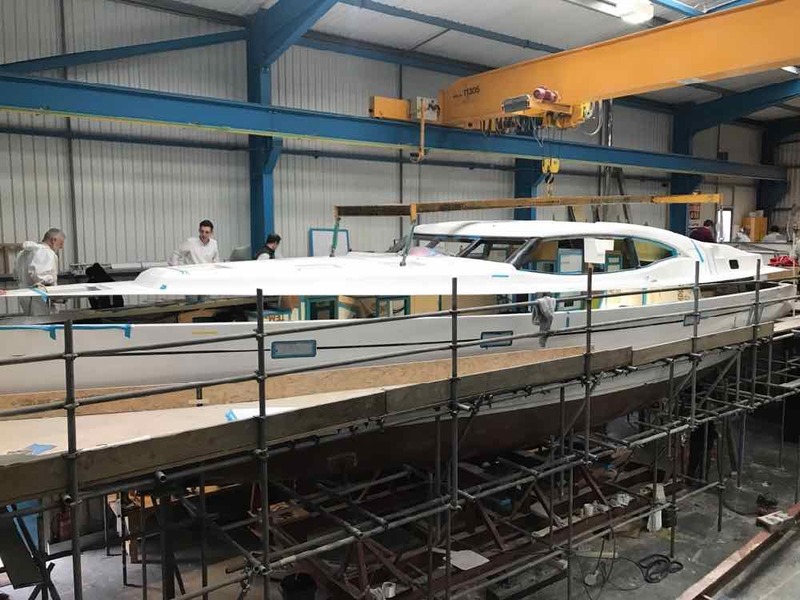 The swinging keel part of the assembly weighs 2050 kilos (4400 pounds) on the Southerly 49 which is about the same as a BMW 740 automobile! I don't think it could rattle. 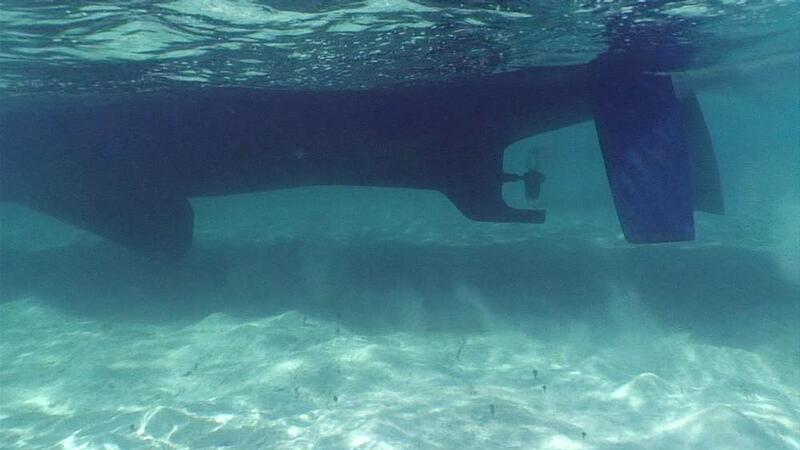 When we drop the keel down all the way it makes a thump as it comes to rest in the stops in the massive grounding plate. 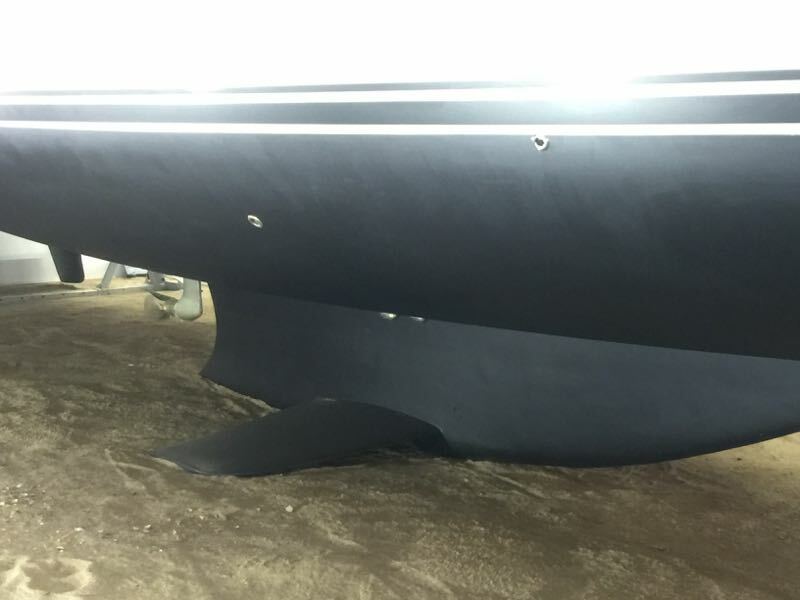 Does the keel require maintenance? Yes. 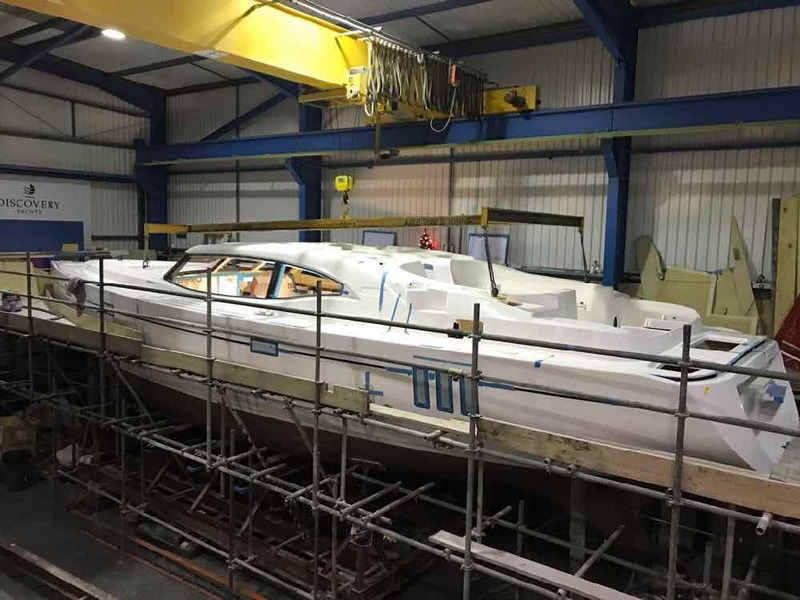 The keel lifting mechanism is a system and as such has a maintenance schedule. Once a year we check the hydraulic level, and every five years we replace the pennant that lifts the keel. 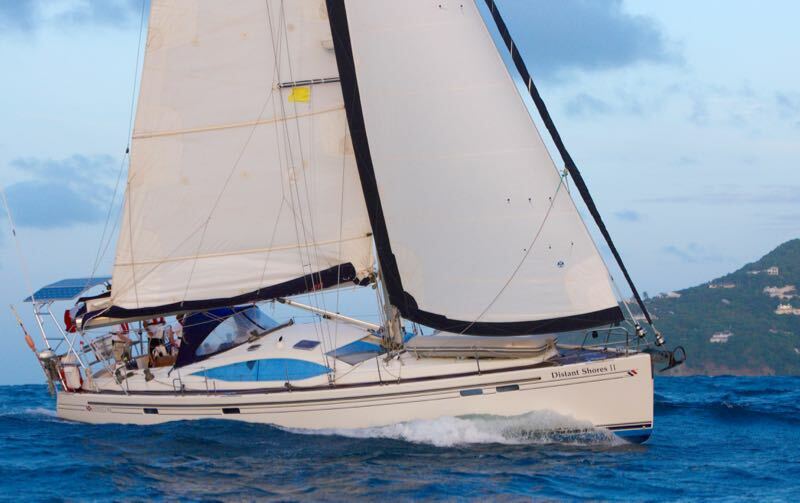 Are you considering a Swing-Keel Sailboat? 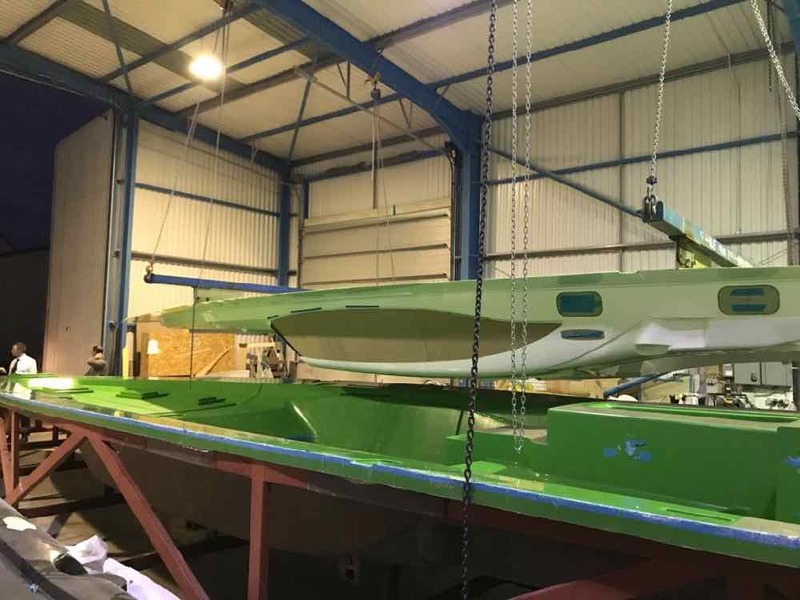 We're currently developing a new model of swinging keel shallow draft monohull. Distant Shores III be 48 feet long with a draft around 3' with the keel up. 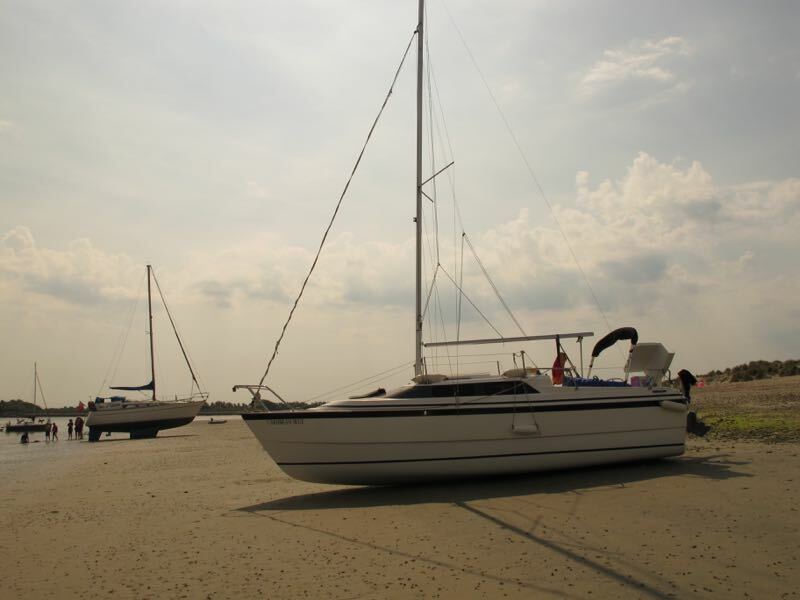 If you are in the market for a similar sailboat and would like more information please email us.